FOUNDERS Sasha Koehn and Erik Allen Ford in their Larchmont Village location. 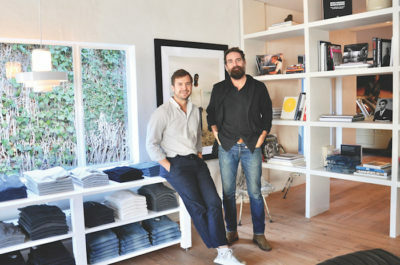 Los Angeles-based menswear brand Buck Mason opened its fifth, and largest, storefront last month on Larchmont Boulevard. The new boutique offers modern American classics for everyday wear, just in time for holiday shopping. To get better acquainted with Larchmont’s newest neighbor, I sat down with the brand’s two founders, Sasha Koehn and Erik Allen Ford. “At 3,000 square feet, this is our biggest store,” says Koehn last month inside the stylishly appointed showroom at 107 N. Larchmont Blvd. Buck Mason’s Larchmont location opened its doors to the community Nov. 1, but the brand will celebrate its official opening Sat., Dec. 1. During this soft-opening period, Ford and Koehn say they have enjoyed meeting local residents who have expressed support for the brand and storefront. “I love to see local families, father and son, shopping together. It perfectly embodies our clothes,” says Ford, who notes that Buck Mason is designed for men of all ages. “We try and make products that we feel will stand the test of time,” says Ford. “High-quality clothes that get better with each wash,” added Koehn. It’s this emphasis on the fit and quality of wardrobe essentials that has catapulted the Buck Mason name from a rented garage in Venice to a successful e-commerce brand with five storefront locations. It all started around 2012 after the two guys met for coffee to discuss a business idea. Ford, who moved to Los Angeles from Missouri, would focus on the fashion side of the business; Koehn, originally from Ohio, would focus on the e-commerce and advertising side of the new venture. “I wasn’t a designer, but I knew enough to hack it,” says Ford, who worked for several years under Lucky Brand founders Gene Montesano and Barry Perlman. “If I had gone to Parsons [School of Design], I probably would have been a lot more confident, but sometimes insecurities cause you to work a little bit harder,” Ford says with a smile. The two started off in a rented 350-square foot garage off Abbot Kinney Boulevard, first selling only third-party merchandise. Soon, Ford was confident enough to start designing his own T-shirt. “At that time we were probably selling 400 T-shirts a month,” says Ford. Then it happened. On Jan. 3, 2014, the “Wall Street Journal” ran a weekend edition article on Buck Mason, where the newspaper described the brand’s T-shirt as the equivalent of high-thread-count sheets. “The morning that the WSJ article ran, we woke up to more than 1,000 transactions,” explains Ford, noting that they completely sold out of inventory by 7 a.m.
Koehn says that he quickly switched the website to “pre-order” after waking up to the rush of orders, which exceeded $100,000 in 48 hours. The publicity brought an infusion of cash, which allowed the duo to add more products and consider expanding. Then, they had the opportunity to take their budding business to “Shark Tank,” the ABC-TV reality show where entrepreneurs pitch their businesses to investors. When asked about the experience, Koehn smiles. “It was definitely the most fun that I would never want to do again,” he says. Spoiler! In the episode, millionaire shark Robert Herjavec offeres the Buck Mason boys $200,000 in cash with a $100,000 line of credit in exchange for a 25 percent stake in the company. They decline. On the bright side, Koehn says that it was a great learning experience, and it introduced the brand to markets in the Midwest and South. “They aired the show a year after it was filmed, so this time we were ready with enough inventory,” Koehn says with a laugh.